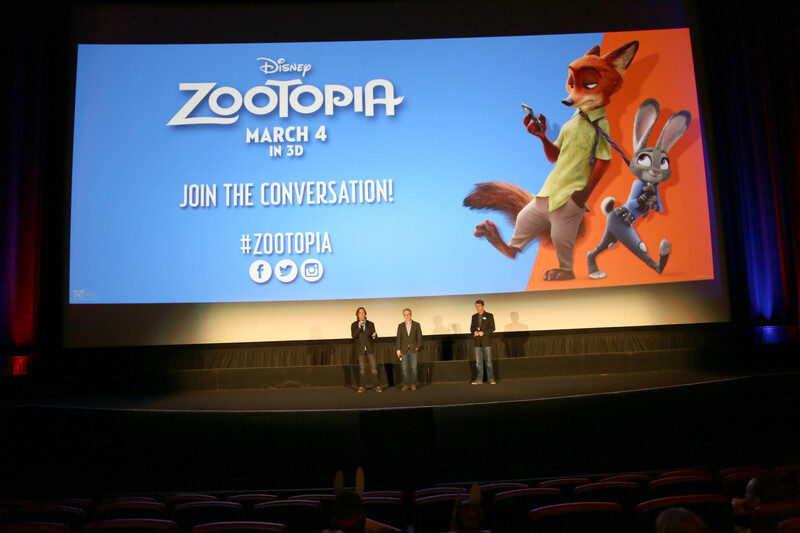 Last week I had the pleasure to attend a special screening of Disney’s Zootopia at Disney Spring in Walt Disney World. To my surprise the directors Byron Howard and Rich Moore dropped by to share with us some of the Disney Magic to look forward to in the film. Let me just say Zootopia really delivers on the Disney Magic! Here is my spoiler free review of Disney’s Zootopia. I have been following Zootopia since the last D23 Expo in Anaheim. We got a taste of the movie at the expo and I was sucked in. At that time Nick Wilde was the main character of the film but if you read my interview with the Writers, Producers, and Directors they share how they moved Judy into the main character spot. 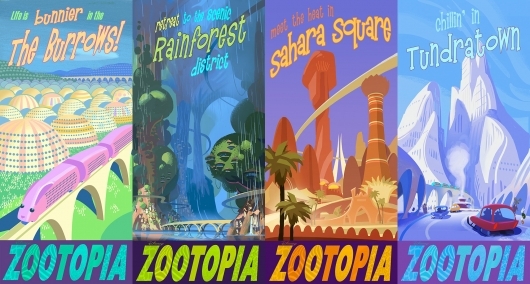 One of the coolest features of the movie was the different districts of the City of Zootopia. You can tell Disney really put in a lot of thought and effort into these areas. The attention to detail was phenomenal! There were so many Hidden Mickeys in each scene many of the Disney Bloggers and I discussed after the film the ones we saw. I use the term Hidden Mickeys loosely as you might look up on the top of a building and see the face of Baymax, or when Judy is coming to the big city you might see a statue of Elsa. No matter what you call them there are so many of these Easter Eggs you can watch the movie 2 and 3 times just to try to find them all! 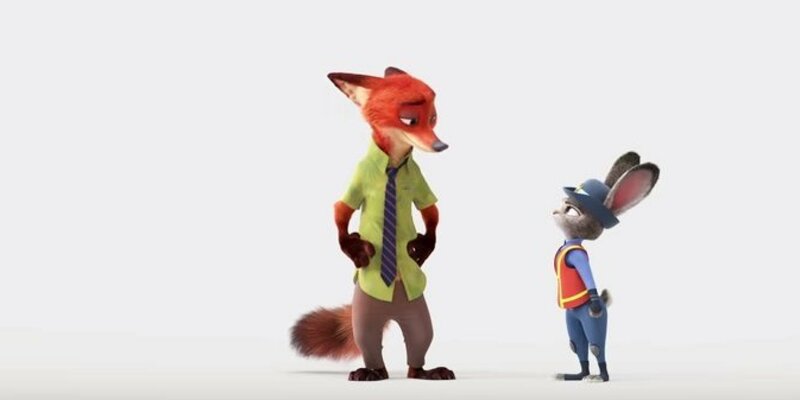 The characters of Zootopia couldn’t be any more perfect. Both Jason Bateman (Nick Wilde) and Ginnifer Goodwin (Judy Hopps) were made for this role. We discuss their characters in my round-table interview, check it out! Ginnifer likes to call the type of film a Bunny Cop Drama. Love it!!! Zootopia is full of action, comedy and many twists you don’t see coming. The bad guy is not who you would expect at all! Ok so I am sure you are wondering is this movie just for kids or will I enjoy it as well. Well I will say that kids around 3 or 4 might not get the movie. There are a few scary scenes but overall the movie is more upbeat and fun. For adults there were so many adult references that many of us picked up on. For example there is a scene with Jessie and Walter, sorry I mean Woolter from Breaking Bad was hilarious. So this is a great movie for kids and adults alike. Without going much further into the film as to spoil the movie I will tell you I LOVED Zootopia. The overall message of any Bunny can do anything is very powerful. Not many movies teach kids that if they work hard and put their minds to it they can accomplish their goals. Disney balances the characters Nick & Judy perfectly, this movie isn’t just for boys or just for girls. I love the original story idea and applaud Disney for thinking outside the box with a fresh idea. I give this movie an A or 9 out of 10. The originality of the movie scored very high on my scale, the characters really pulled you in, and the movie has plenty of rewatchability. Zootopia is in theaters on March 4th. Go out and see it and let us know what you think!